This is an initial summary of our experience and observations in training with Czechoslovakian Wolfdogs. It is based on a relatively short period of 18 months. In 1955 an experimental program was commenced in Czechoslovakia by crossing a German Shepherd Dog and a Carpathian Wolf. The experiment confirmed that the offspring of both a male dog crossed to a wolf, and a male wolf with a female dog were viable. The intention was to create a dog that would be a perfect working dog, possessing greater endurance, greater intelligence, a better sense of smell and better protection skills then any other working dog. The designers of the program were of the view that the majority of offspring from the matings were compatible with their program objectives. In 1965 the initial experimental phase was completed, and a breeding program was set in place. This was under the auspices of the Czechoslovakian Army. The goal was to combine the endurance and intelligence of the wolf with the favorable temperament and working qualities of the German Shepherd Dog. The program commenced and breeding continued. In 1982, the Czechoslovakian Wolfdog (CSV), through the general committee of the breeder's associations of the CSSR was recognized as a national breed. 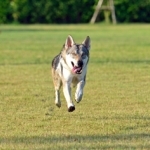 In 1999 the FCI recognized the Czechoslovakian Wolfdog as a proper breed. In a real sense the goals and objectives of the experiment were not met, and from that perspective it could be considered as a failure. The CSV did exhibit improved health, intelligence, scent capability and endurance. In fact, in the case of endurance it far exceeds that of any of the current working breeds. However the CSV also exhibited a lack of the positive types of drives necessary for serious protection and security work. While the CSV exhibits the ability to act in a defensive drive under threat (similar to a wolf), it is not easy to trigger them into positive and controlled aggression for personal or tactical protection work. The intelligence of the CSV is quite high, but for high level obedience and control this is not necessarily an advantage. The dog will consider the necessity of obedience or its level of interest or willingness to carryout a command. Ultimately the CSV was used for some border patrol work, often in groups. Scent work by the CSV was quite good under certain deployment circumstances. A number of the CSV were utilized in scent related work. Training in this area as we have seen from our own experience can be motivated by food rewards. Nonetheless due to the reasons stated above, the CSV were not deemed suitable as military working dogs. As a footnote to this, there have been several other Superdog programs that involved breeding wolves and dogs, the U.S. military also experimented with this. There have been no serious successes with these programs. There have been a number of breeders who have crossed wolves with dogs, and unfortunately done so with far less science and knowledge available to them than the various militaries that have tried it. Recently we saw someone trying to cross a CSV with a Malinois. This was done with virtually no consideration or understanding of the characteristics of the lines they were dealing with and with little clear purpose. To stabliize a breed in any event is generally considered to require at least 7 generations. At this juncture the CSV is a stable breed, and it seems at least in our opinion that further "experimentation" will not yield attractive results and should be avoided. Within the last 15 to 20 years a number of breeders have become active in breeding and selling the CSV. The breed standards are published and setforth under FCI and a number of National Clubs. The concentration has been on appearance, health and in many cases mental stability, but not on working characteristics. As a result, while there have been a few individual CSV’s that have exhibited capabilities in working sports, the majority have not been exposed to working sports or training related to it. This makes it virtually impossible to identify working lines as one might do with a Malinois, GSD or Dutch Shepherd. There may be characteristics within a certain breeders line that would lend themselves to working sports, and these characteristics may be overlooked by the breeder and the customer base. On a coordinated basis there is just no way to judge what volume of CSV's might have working potential or to what extent the breed has moved away from that potential. This is not completely unusual when dogs are geared more towards a market for shows and appearance. From our experience, and I must say that it is limited to a year and a half at the time of writing, most CSV breeders that we have met have limited knowledge of sports and protection training. The forums we have seen, and the platforms for information exchange on the CSV concentrate primarily on appearance, purity of the breed, and health issues. There are some discussions on basic training, but they are generally at a very primary level. These comments are in no way meant to detract from the obvious passion and dedication to the CSV shown by many of the owners of the breed, nor are they intended to imply that all CSV must be put through some type of formalized training. As mentioned earlier the CSV is very strong on scent capability and has very good endurance. Given the limits of understanding of individual lines that I described earlier, we decided to institute an experimental program for training CSV’s. The purpose of the program was more to learn about the nature and behavior of the breed, as well as reactions and capabilities to various forms of training approaches. In doing so we exposed the CSV’s to both sports training such as IPO, scent work and detection, agility training and obedience training. The total sample we have worked with is not large enough to be statistically significant, and hence our observations must be treated as anecdotal. One male CSV was brought in at nearly age 4, two females at approximately age 3, a female and 2 males at age 10 months, 2 males and a female at age 8 weeks, and a male and female that were born at our kennel. More than any other breed we have been exposed to, early socialization in the CSV is extremely critical. A young CSV needs to be exposed to every practical type of environment, sound, terrain, people, and other dogs that one can possibly arrange. They operate almost as if it was a checklist. With each exposure, they appear to accept the new input. Like any canine there are variations between individuals, with some exhibiting more confidence than others, but overall the critical nature and benefit of this early socialization is paramount. The CSV appears to somewhat lock personality at around 5 months of age. If not socialized well prior to this age there is what we would term a behavior reversion. By nature the pack instinct is very very strong, more so than most breeds. If not socialized there is high potential for an innate shyness to occur. This results in a very cautious dog that is not particularly open. The behavior is not aggressive, but the dog will shy away from contact with strangers, and will establish bonds with individuals only after a relatively prolonged period of contact. In short then, with proper socialization you have a friendly “dog”, without it you have a shy “wolf”. Some examples of how we reached this conclusion are as follows. The two female adults in our sample were brought in at age 3, one from France and one from Hungary. Both were kennel/pack raised. The female from France had relatively little human contact; the female from Hungary had exposure to the breeder, and limited show exposure. Neither was given any formal socialization and both were raised in a pack environment. Both dogs after a period of several weeks became friendly with their handler. They would approach and play briefly, and then remain aloof until they decided to re-establish handler contact. When strangers approached the dogs would seek a safe location out of “range”, they would not make an attempt to check out the stranger. If directly approached, they acted passively. Both dogs clearly prefer the company of other dogs, especially in a pack, and display discomfort at being left alone without another dog present. Except for very basic obedience such as sit and down, training is not practical. Basic obedience to the extent it was achieved was done with food reward. The 4 year old male had some socialization and exposure to multiple people and locations, but not that broad of a range of socialization. He is confident by nature, friendly towards strangers, and slightly wary of new experiences. He reacted reasonably well to obedience and agility training. Attempts to train him in any form of protection were not very successful as he could only be provoked into a defensive mode. Two males, one from Hungary and one from Belgium were brought in at age 10 months had already been socialized, one in a more limited environment, the other quite extensively. Both males are friendly and open, and fully approachable. Both males have passed their IPO BH certificates, and their IPO 1A tracking certificates. Both males show a limited willingness to do protection work, but it is more game based than aggression based. I will describe our training approaches later in this paper. One female brought in at age 10 months was well socialized. She bonded very quickly and has been living in a home environment with us. Her obedience training is very good, but she is also somewhat stubborn and will do obedience work when she is interested. She is very good at scent work, and shows little interest in protection work. Her family bond with our immediate family is the strongest we have ever seen in a dog. Two males were obtained at age 8 weeks; they are now 18 months old. One was from the Czech Republic the other from Hungary. Both were socialized extensively. At around 6 months of age the male from Hungary exhibited some tendencies towards caution and slight shyness. He is overall open and friendly. He was trained in IPO obedience and passed his BH certificate. The male from the Czech Republic exhibits more confidence; he has also passed his BH certificate, but shows promise for sports protection training, and is very good at tracking. He exhibits reasonably good curiosity towards new experiences and new people. One female was obtained at 8 weeks of age from Lithuania; she was extensively socialized initially by the breeder and in both our home environment and in the kennel. She is now 6 months old. She shows interest in obedience and agility training, no formal attempts have been made in protection training, but she enjoys play biting with tugs. It is too early in the cycle to make observations. The male and female born in our kennel are now nearly 9 months old. Both were extensively socialized. It is worthwhile to note that they are the offspring of the 3 year old shy female from France. Both dogs are confident and stable. They approach strangers readily to say hello and play. Both dogs have showed good capability in obedience and agility training, but display little aptitude or interest in protection work. All of the wolfdogs demonstrate natural capabilities in scent work. One must differentiate the term scent work, from sports tracking. By nature the wolfdogs use a combination of air and ground scenting. When training for sports it takes more time than with a mainstream working dog to teach them to ground scent only. For practical deployment in SAR work, the wolfdog shows very good promise. From correspondence and contact with owners of wolfdogs, perspective owners, persons interested in wolfdogs, and breeders there is a wide diversity of intent with respect to keeping and raising these dogs. There is also apparently a wide range of misunderstanding as to the capabilities of the wolfdog and their potential. Some people appear to fantasize that they are getting a piece of nature, a wolf so to speak. This breed has been bred for effective domestication, and despite appearances should not be confused with a wolf. Some people think that the dog will be perfect for protection since they have the notion that a wolf is aggressive. The wolfdog is by nature not very aggressive. Some exhibit natural prey drives which is to be expected. They do not naturally act in what we would term positive aggression. It is very difficult to train them to act aggressively on command if they do not see a threat. This limits their potential for both sports and protection work. It is in our opinion the nature of the CSV. The CSV can be triggered in defense drive and will then bite, but this is when agitated or threatened. Care must be taken with this type of training, or the results to both trainer, people in proximity and in the mental state of the dog may be less than desirable. Our normal sports training is with Malinois and Dutch Shepherds. We train both from drive where the reward may be a ball or a bite tug, and we also use clicker training and shape training on occasion. It is important to recognize that the over riding theme of the training approach is “drive” based, and comes from the breeds themselves. Training a CSV based on drives is not the same. As a juvenile the CSV has relatively high play drive, but this is in fact PLAY DRIVE and should not be confused with terms like ball drive, defensive drive, aggression drive etc. A young CSV will chase a ball, grab a tug but it is a game, and does not form the basis of a future training reward in most cases, unless it continues to be game based. The CSV is very intelligent, but this leads easily to boredom with repetitive exercises, and if over done they will lose interest. Training sessions need to be short and focused. Where a Malinois may happily repeat an exercise until the trainer gets bored, a CSV will not. In training for obedience, when guised as continued play the CSV will happily go along with you. The CSV will also work out of “bond”. The female that has lived in our home is now over 2 years old, she has an extremely strong bond with me, and will follow obedience commands out of the bond. The CSV’s all have one very strong drive, food! It is from this drive and training derivations using this drive that we have been able to achieve various degrees of success in training. In training we have found that conditioning to food reward forms a substitution for drive training. This is still an ongoing exercise for us. The current approach is to combine shape training with food reward. This causes the CSV to partially self teach the desired behavior. The shape training is done with a clicker to create the reward association. This approach is much slower than the type of training we would use with a Malinois, but appears to work. An example would be teaching a retrieve. The CSV is not a natural retriever. When young they will pick things up, but without reinforcement this disappears after around 6 to 8 months of age. Shape training for a retrieve requires breaking the exercise into very small parts. First is touching an object for a reward. Next is picking up the object for a reward. This is followed by progressively longer periods of holding the object for a reward. Separate from this is the teaching of a recall to handler for reward. When these steps are accomplished the exercise then needs to be combined, again for a food reward. Ultimately with many sessions the combination will work and the CSV will pick up and object and bring it to you. The same can apply in bite work, but it must be emphasized that this is a form of play; your prospect of training a CSV for serious protection work is not high. In bite work, the CSV in play mode can be induced to grab a sleeve. It is usually a hit and run bite, which is typical of a wolf. Shape training allows for a reward in return for holding the sleeve progressively longer. The sleeve becomes a game target that results in a reward. This allows for us to induce a chase on a running decoy. The performance may ultimately be adequate to pass an IPO protection trial; expectations of high performance should be limited. It should also be mentioned in the context of protection that while the CSV like a wolf can bark, they do not do this often, and barking on command while trainable is not easy to accomplish. There is perhaps one exception to my comment about protection, and this is in fact based on a natural response. When a bond is established with a CSV, there is clearly a protective response for the pack. Since the handler is in effect the pack leader, many of our CSV’s will show an inclination to protect if the handler is threatened. This is not a protocol that can be easily trained or controlled, and appears to work only from a strong bond. I should also make the following observation and caveat with respect to pressure training and corrections in training. Many working dog trainers are used to putting their dogs under a fair amount of pressure in certain types of training, this is common in KNPV and not uncommon with some IPO trainers. Corrections with some dogs that are considered "hard" can also be hard including e collars and prong collars. CAVEAT this type of training does not work well with CSV. The CSV does not react well to pressure training and goes into avoidance mode. Positive training is about the only approach that will yield success. Attempts at negative training, especially when it is early training (learning phase) will in all likelyhood fail. With regard to corrections, many CSV appear quite sensitve by nature, leash corrections in the form of a quick tug, and with some tougher CSV's a choke chain collar will work. Any high physicality is likely to be resisted. In some cases if you do not know the CSV well and you attempt to administer a very strong correction you risk putting the dog into a defensive mode and it may lash out at you. Working from bond and trust, and the use of positive training and incentives is by far the best approach. Corrections can be used mildly if the dog has already learned an exercise and then chooses to ignore it, but the emphasis is on mild. While I have talked about training for sports, the concept of clicker and shape training combined with food reward appears in our view to be the best overall prospect for training approaches with CSV’s. We have also initiated agility training with the CSV’s. This is a mix of game play and food reward. The CSV’s enjoy agility work. They are naturally good jumpers and relatively agile, they also have good endurance. The variety of an agility course and the training that goes with it appears to counter their natural tendency to get bored quickly, and is by nature less repetitive than the training required for a sport such as IPO. Within the environment of agility training reinforced by food reward, they have advanced relatively well. I would still at this juncture be reluctant to plan to compete a CSV against a border collie in agility, but it is a very practical activity with CSV’s. I have mentioned scent work several times in this paper. The CSV has a much greater scent capability than most breeds, and a high degree of curiosity towards scents. Teaching a CSV to find a specific scent is not difficult. While it requires some redundancy in training, the identification of specific scents in return for food reward is relatively straightforward. The CSV is also naturally good at following a scent, so finding a person hiding at distance through a mix of air and ground scent is virtually natural to them. In an exercise within a 1 square kilometer area, my female CSV will find me rather quickly no matter where I am hiding. This lends to the idea that the CSV has potential for Search and Rescue training, and it is an area well worth further pursuit in training. This paper is an initial summary; it is not intended to be an all-encompassing review of training, training approaches or the trainability of the CSV. It is also not intended as an overall commentary on the CSV. It is simply a series of observations made over a period of 18 months. We have another year or so to go until we will be able to complete certain training modules and reach some more concrete conclusions based on actual results. We will continue to update this paper until we have a final document that better summarizes our work with the CSV.